US, 2002, 115 minutes, Colour. Nicolas Cage, Meryl Streep, Chris Cooper, Tilda Swinton, Kara Seymour, Brian Cox, Ron Livingston. Listening to critics talk about Adaptation, one heard that it was very entertaining and clever or else that it was too clever by half. 'Clever' seems to be the operative word. The director, Spike Jonze, and the writer, Charlie Kaufman, found that with their first collaboration, Being John Malkovich, everyone thought that they were very clever - a movie about getting inside a real film star's head for fifteen minutes and seeing life though his eyes. 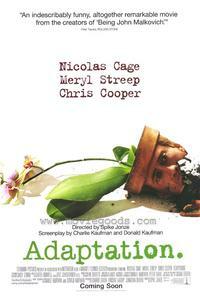 Capitalising on Being John Malkovich, Adaptation opens on the set of that film, with the stars there, discussing things with Kaufman who is being played by Nicolas Cage. The trouble is that Kaufman is having trouble with his adaptation of articles written by the real-life Susan Orleans (who will be played by Meryl Streep). He has writer's block, has a dim view of himself, feeeling that he looks like an unkempt slob, is too reserved and has no talent of flair with women. However, his twin brother, Donald, is writing a formula cop movie (with all the trendy themes), is a charmer and oozes confidence. Donald is also being played by Nicolas Cage in a very effective performance where he keeps the twins quite distinctive in manner and style. (In fact, of course, even though the screenplay of Adaptation is attributed to both Kaufman's, the only place that Donald exists is in Charlie's imagination and in the film.) Perhaps, with having two Kaufmans, this is being too clever by half, where half might do. Charlie goes to New York to meet Susan Orleans. He goes to Florida to meet the subject of the film who is an orchid thief in the Everglades (Chris Cooper in his Oscar-winning performance). This means that Charlie is able to unblock himself by writing a screenplay about how difficult it is to write a screenplay on The Orchid Thief and how he does it. When Donald achieves success, he is able to help Charlie who goes to screenwriting classes by real-life expert, Robert Mc Kee (played in the film by Brian Cox). And so on, with plenty more plot ingredients included Charlie's agent, his girl friend, the meetings with Susan Orleans and (maybe the influence of Donald and McKee) a shoot-em-up chase through the Everglades to finish up. Spike Jonze juggles all these aspects like a movie jigsaw and a visually stylish one at that. Dialogue is witty, performances are good - really sophisticated entertainment. The real Kaufman must have been on a role because he had also written the screenplay for Confessions of a Dangerous Mind, about TV series creator, Chuck Barris, who claimed that he had a secret life as a CIA assassin while doing The Dating Game and other programs. Being John Malkovich? The work of the writer: Human Nature, Confessions of a Dangerous Mind, Being John Malkovich? Audience expectations from this duo? 2. The title, the adaptation of the book about orchids, writing Hollywood scripts and having to adapt, each of the Kaufmann brothers and their having to adapt? Hollywood - adapt or die? 3. The structure of the film: the opening with the filming of Being John Malkovich, Charlie Kaufmann's experience of making the film, watching it, the way that he was treated as an outsider? His being commissioned to write the screenplay for The Orchid Thief? His struggles? The flashbacks to three years earlier, with the commission to write the script, with the encounter with Susan Orlean, his work with his brother, Donald? Three years earlier to the experiences of John Laroche, his exploits in the Everglades, the stealing of the orchids? The interludes with the three-minute brief history of evolution, the interlude with Charles Darwin? The role of the voice-overs, the reading of texts, the discussions? Charlie Kaufmann and his interior monologues? The visual aspects of the film, verbal? 4. Robert Mc Kee and his theories about film-making? Against voice-overs and flashbacks and the ironic use of these? His focus on plot, character development, action endings? Donald Kaufmann and his having gone to the seminars, quoting Mc Kee? Writing the police thriller, the serial killer, craziness, the crass aspects, the parody of the genre? The irony of the solution with the threefold split personality? The joke about Charlie Kaufmann splitting his personality between Charlie and Donald? Charlie going to Mc Kee's seminar, the style of the lecture, contents, Mc Kee's manner? The aftermath and his talking with Charlie, having a drink with him, the recommended ending? 5. The Laroche story: the orchids and the explanation of their beauty, the effect on people, collectors, addictions? Laroche as a tough character, life in Florida, the swamps? His quests, his helpers? The encounter with rangers and the soft talk? The getting of the orchids? Laroche and his other jobs, relationships? His ideas? The story for The New Yorker, the interviews with Susan? The revelation of himself, his history? The friendship with Susan? Her articles, the continued phone calls, the affair, the drugs? The decision for violence against Charlie Kaufmann, going to the alligators, the violence and Donald getting killed? A portrait of an eccentric character? 6. Susan Orlean and Meryl Streep's style? Her reputation, work, The New Yorker? Seeing her in the office? The type, her skills? The mission to go to Florida? The encounters with Laroche, going into the swamps, seeing the orchids - and getting lost? Her fascination with the orchids, the voice-overs of her reflections, commentary on the experience? Becoming more involved, the phone calls, the interviews? Further contacts? Charlie Kaufmann and his visit, in the elevator with him but not recognising him? Going to Florida again, the affair? The drugs and the phone call? Her instigating Laroche to violence? Meryl Streep doing a spoof of her more serious characters? 7. The portrait of Charlie Kaufmann, fat and bald, shy, awkward? Valeria and her demands for the screenplay? His discussions with his crass agent and trying to explain his insights and their being interpreted in crass box-office style? His awkwardness with women, friendship with Amelia, the dates, his not being able to follow through? Losing her? His preoccupation with women? Sleep, dreams? Writer's block? Trying to grapple with the idea of how to adapt The Orchid Thief? The intensity of his experiences, anguish? 8. The contrast with Donald and his arrival, his ability to write, the serial killer people thriller? His attitude towards women, ease with them? His quoting McKie? The film's visual contrast between Donald and Charlie? The ability of Nicolas Cage to create different characters for the twin brothers? 9. Charlie going to New York, his awkwardness with Susan Orlean, seeing her but not introducing himself? His desperation in going to the McKee? seminar, the discussions with Mc Kee? Donald and his successful selling of his screenplay? Getting his help, their going to Florida, discovering Susan Orlean and Laroche? Donald and his pretending to be Charlie, Susan's reaction? The decision to kill him, Donald driving in and being killed in the accident? 10. The build-up to the finale, Mc Kee's theory, action? The flower focus at the end? The impact of the orchid story, the development of characters, screenwriter's block, the mocking of Hollywood, the use of Hollywood? Screenwriting and the limitations of power in Hollywood?